After three days of questioning by experts on the Constitution and Bill of Rights, East Grand Rapids High School students finished 8th out of 56 teams from across the United States. According to Linda Start, Executive Director of the Michigan Center for Civic Education, finishing in the top ten is an impressive achievement. During the three-day competition, panels of judges, including state supreme court justices, constitutional scholars, lawyers, and public officials challenged the students to apply constitutional principles and historical facts to contemporary situations. 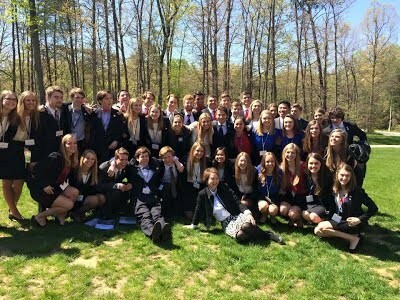 The first two days of competition were held at George Mason University in Fairfax, Virginia. The top ten teams competed for a third day on Capitol Hill. “They are knowledgeable and able to weave together information from all of their studies into coherent arguments. The judges kept saying their knowledge level is well beyond what they see even in law school”, said Yates. The team earned the right to compete at the national level after winning the Michigan We the People State Finals in January. The Michigan We the People program is conducted by the Michigan Center for Civic Education.